The Triangle metropolitan area ranks third following San Diego and Boston in a study of 'Top Biotech Centers' released Monday. Conducted by the Milken Instititute, a nonprofit research institute based in Los Angeles, the study measured metros around the country on 44 different metrics from the biotech venture-capital funding environment to the number of biotech scientists working in the region. Writers of the report claim it is one the most comprehensive measurements of regional biotech centers. The biotechnology innovation pipeline, or the infrastructure that allows a metro to capitalize on its biotech knowledge and creativity, such as the quality of its work force and amount of research and development dollars it receives. Secondly, the current impact assessment - an area's success in bringing ideas to the marketplace and creating companies, jobs and products. It is always nice to be in the Top-5 of such list. I am not really surprised, considering the continuous efforts by the local biotech companies to maintain and strengthen Triangle's biotechnology infrastructure. Honestly, I did not know anything about San Diego's biotechnology sector, so it came as a surprise... although a pleasant one. I'm not surprised. As a former Durham resident, I see that area is full of intellect and creative buisiness attitude. So I could see the area becoming number one as it continues to grow. Biotechnology will get even stronger in the Triangle, judging from bits and pieces I read every now and then. Personally, I prefer a more diversified economy, but I support whatever helps the area gain [positive] visibility. Congratulations. I do business in Charlotte and the climate is just fine. With or without the ranking. Hey moonshield! can we get some of that shine bro with out you making these wise comments we no that Charlotte is doing big things! Can we get some love too man without you Hating on the Triangle man!!! I don't hate the triangle. I just hate these rankings. Weren't you banned before atb for not knowing how to quote? Will you please learn to quote???!!! please no . . . .
please not another thread about atb's ability or inability to quote! and what does Charlotte have to do with this thread? In fact what is this thread about? It is a repost of an article in another thread. Sheesh, you all are making it hard to lurk! ok ok ok time to be on topic! I think its good advertising for the city, and hopefully the business climate will entice relocations and help new companies to thrive here. I think we are really in a unique environment and we often overlook the things in the metro that this ranking takes into consideration. We take our 3 world class research universites for granted (except basketball season), but that is really a rarity. Most metro's are lucky to have 1 large university, we have 3 in close proximity. I remember some statistics such as the largest library system in the US outside of Boston (excluding the LoC I'd imagine). We have like the 2nd most PhD's per capita. The college graduates we produce provide a constant influx of talent from around the state and country. As the starter of this thread, I would like to note that this one was started 6 days before the other...therefore this is not a repost from another thread, in fact quite the opposite . Sterlings released a new chart ranking the most expensive metro areas for commuting in the U.S. The bulk of the list is taken up by southern cities. Sterlings blames suburban sprawl as the main culprit. What do you think? The Triangle ranked number 9 just ahead of Los Angeles. Once again, Raleigh ranked highest in the Carolinas. Other NC cities on the list are Charlotte (33rd) and Greensboro (40th). Denver tops the list for the second year in a row. It's interesting to me to see Raleigh topped Charlotte not only in culture (I kind of figured it would) but in nightlife. I'm not sure how they determine stuff like this. Anyway, this is just a silly thing they do every year, but its always nice to see your city near the top of lists like these, especially with places like Denver, Boston, and San Francisco. #4? That seems a bit high to me. Maybe the biggest factor is that there simply are a lot of singles around here (college grads galore, and lots of young professionals) and a lot of job opportunities for the typical single. But on the whole, I wouldn't expect to see the Triangle in the top 10, much less at number 4. Still makes me kina proud to live here, but these sort of rating things don't really mean much. Good article but I think there is a difference between higher income and expensive cities to live in. The article talks about high income cities and not much on cost to live in the city (outside of few comments on NYC and such). San Jose and Raleigh are a lot alike except Raleigh does not even come close as expensivea as San Jose. Raleigh is still a fairly cheap place to live when looking at other fast growing areas. Much of the west and north is a lot more expensive to live in. I know of a couple in San Jose, they both work at a fortune 10 company, have graduate degrees and make 6-figures plus a piece and they are living in a one-bedroom apartment because they can not afford a starter home. The average starter home is north of $450K and when you talk of decent it is higher. That is a starter home. I know people who sold their older condo in San Jose and came to the Triangle and bought acres of land with a big house and still had cash in the bank. A $175K condo here in the Triangle goes for $500K--$700K there. Well the nice thing is that wages are relatively high and the average home cost is low. Looks like Va Beach made the list. Housing here has jumped 50-75% in the last couple of years and unfortunately personal income here is still stagnant unlike our competing cities - Raleigh, Charlotte and Richmond. These forbes rankings are pretty annoying to me. For one, the data that they use is typically mixed up. For instance, median house price is for the Raleigh-Cary Metro Area, but the median income is for the city of Raleigh. Typically, though not in this case, Forbes refers to Raleigh when they really mean the Triangle in general. 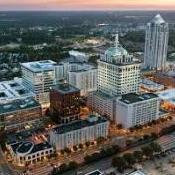 When Forbes ranked best cities to live in, they said that the "closest city" to both Cary and Durham was Raleigh. What the hell does that mean?